What does it mean to be a mother? Maybe you know because you are one. Maybe you know because you were raised by one. Maybe you know because someday you will be one. There are many aspects of raising offspring, and many tactics and strategies that mothers use to keep our children safe and out of harm’s way. And although being a mother is a uniquely special experience, we humans are not the only beings who exhibit maternal extinct, defensiveness, sacrifice and love for the young ones we bring into the world. Every living creature has a mother. And while this may seem like commonplace knowledge, it doesn’t often create the connection between humans and other living beings like it should. We can help bridge that disconnect by not only acknowledging that other living species are also parents to their young, but by recognizing how deep their bond goes and by appreciating their stories. We start with the story of J2, also known as Granny, who was the world’s oldest known orca, until her disappearance and presumed death sometime in the fall of 2016. 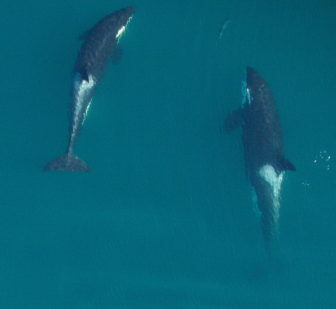 The southern resident killer whale was easily recognized with her distinguishing markings and unique behavior, and was one of the most beloved amongst whale watchers. Recent estimates put her age between 60 and 80 years old. Granny was a very special orca because when she was discovered in Washington State’s Puget Sound in the late 1960s, she was already an adult. During this time orcas were being heavily corralled and captured for display in aquariums, but due to Granny’s advanced age and unlikelihood of surviving transport to a marine facility, she evaded capture and went on to live another 5 decades in the wild. Granny began to gain worldwide recognition, not only for her age but also her personality. She was “exuberant and fun to watch”, according to whale watchers. Granny was also commanding, and a bit of a leader. “The resident killer whales that occupy the waters of Puget Sound and the Strait of Georgia form the J, K, and L pods and Granny was always the one out in front of J pod.” Amongst killer whales, matriarchs play an extremely important role. They help to determine where the rest of the pod should travel and where to eat, which means that Granny’s leadership probably played a large role in the survival of her pod, including her offspring. It was said that Granny also had “peerless strength”, so much so that even within a few months of her last sighting, when she was probably close to 80 years old, she was still regularly vaulting out of the water. One scientist called her “the Energizer Bunny of whales.” Granny’s strength and energy may remind you of how many mothers we know seem to do nothing but keep going. Mothers are often left to take care of thankless tasks, and asked to keep pushing on even past when they feel like they can anymore. Mothers are asked to dig deep for boundless energy even when it seems impossible, and much of the time this effort is made for the sake of their children. For who else would lead the pod? Granny was also known to pick up stray males, helping to care for them when their own mothers died. A young orphaned male known as L87 was often seen following Granny around the waters they swam in her later years. How could we not respect that deep maternal instinct to care for the lonely and afraid? How many mothers do we know who reach out to others when no one else will because it’s simply the right thing to do? Though we can only speculate to some of the pieces of her story, it would appear at the very least that Granny maintained at least some level of instinctual empathy. “She was the counselor, the guide, the teacher of traditions.” With Granny’s death, it brings the endangered population of killer whales down to 78 from a likely high in the 1800s of 200 or more. 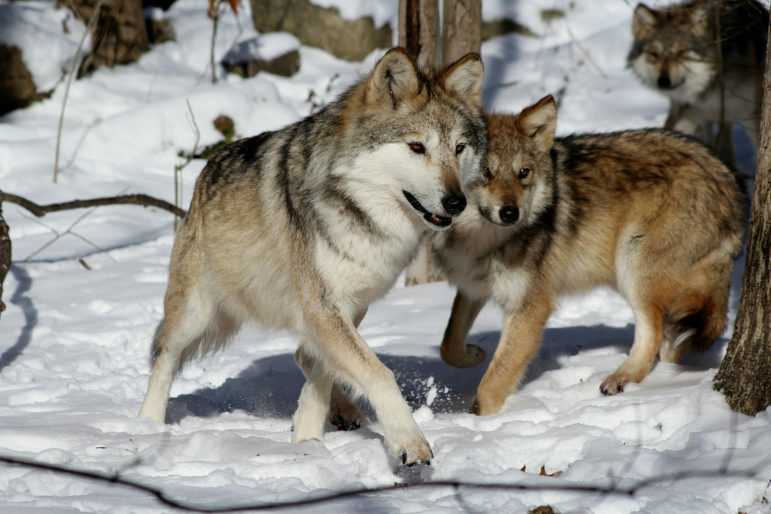 Another tale of dedication and motherly love comes from two Mexican gray wolves (aka “lobos”), F1226 and AF923. This type of wolf is the rarest and most endangered subspecies of the gray wolf. Their historical range includes much of the southwest including Arizona and New Mexico. This species was very close to being eradicated in the 1970s, however, starting with just seven individuals, the U.S. Fish and Wildlife Service (FWS) began a captive breeding program to save the species from extinction. In 1998, the first individuals were reintroduced to the Blue Range Recovery Area in New Mexico, and scientists have been working to recover their fragile population ever since. “In recent positive steps toward recovery, FWS has forged ahead despite political opposition by ushering captive wolves into the wild through its pup-fostering initiative. Pup-fostering is a coordinated event where captive-born pups are introduced into a similar-aged wild litter so the pups can grow up as wild wolves and help augment the genetic health of the wild population.” Part of the reason pup fostering continues to be used to rebuild this critically endangered species, is due to the success of the first loba foster mother, AF923. She died in May 2016, but not before successfully fostering pups from another pack. 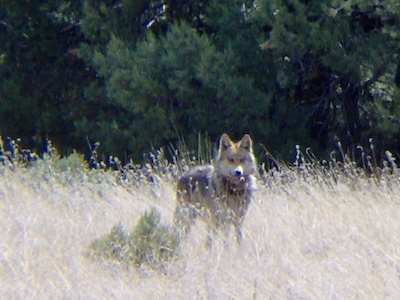 After her capture as a young pup and subsequent re-release in 2007, AF923 eventually became the alpha female of the Dark Canyon pack. 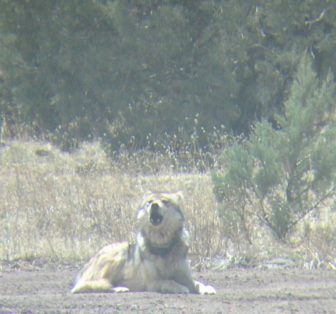 For the first three years, none of the pack’s pups survived until the end of the year. A second female’s mate abandoned her and her litter of five, and fearing for the survival of wolves abandoned by a female wolf from another pack, scientists placed two of the five pups with AF923. And it worked! Their success paved the way for the placement of six other captive born pups into three wild dens in 2016. Human mothers have this instinct as well. It’s why we mourn the death of animals, why we adopt children whom we didn’t birth, and why we remember what it was like to be in our children’s shoes when they suffer: because we have the ability to empathize, to feel another’s pain and try to alleviate it or save it. Wolf mothers who unknowingly foster may behave from instinct alone, but where does that instinct come from? It would seem as though their instinct to protect their young, any young, is similar to our own instinct to help those in need… wouldn’t you say? That brings us to the story of a grizzly bear given the identification code 399. She has become the most famous living wild bear on Earth. She is universally beloved, and despite some political controversies, continues to call Grand Teton National park her home. 399 first became famous when, in 2006, she appeared along the roadside in Grand Teton Park. She was easy to spot, and so of course, became a spectacle for visitors and tourists. She’s made a habit of crossing and walking over roads throughout the park, which excites people who may otherwise never have had a chance to see such beautiful wildlife up close. Biologists suspect she may have started doing this after a male bear had killed her first cub in the backcountry and so she began looking for a safer place to raise subsequent offspring. She has been known as a particularly fertile bear, and has spawned 16 cubs. She has also been the subject of a book and has a Twitter account! 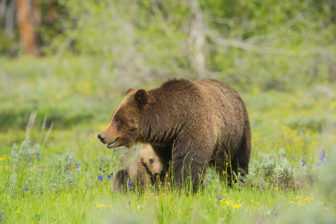 Even a hiker mauled by 399 and her cubs in 2007 for accidentally stumbling upon an elk carcass they were feeding at, pleaded for the grizzly’s life to be spared. After park officials examined evidence, they ruled that the mother was only behaving naturally and shouldn’t be lethally removed. This was a public acknowledgement to a maternal instinct that would have otherwise had the bear euthanized. Though 399 over the last decade has shown no aggression toward people, even as she and her offspring navigate huge crowds of onlookers, this instance of a mother bear defending her cubs against a frightening “threat” was actually understood and appreciated both by authorities and the hiker. What mother wouldn’t come to the defense of her babies? Life is no picnic for mother bears though. In the rugged wilderness of Grand Teton, more than half of 399’s cubs or descendants have perished. You can imagine the tense excitement when after a particularly long hibernation in 2016, 399 was finally spotted again on the morning of May 10, 2016 with a new baby cub. She was now 20 years old and this bear cub would probably be her last. The cub seemed special too. He was larger than most, with a white face, and the two played together often. People who’ve been watching her for years have never seen her play with a cub like she played with the white-faced one. That’s why it was particularly tragic when in June 2016, 399’s last cub was killed by a car. A wildlife photographer who had hoped to get some pictures of 399 that day, instead walked onto a tragic scene where 399 was seen dragging the body to the side of the road. This is a gruesome reminder that life is precious and short, and that even for a bear as fertile as 399, seeing your offspring through difficult times isn’t ever easy. Life can be cruel and unfair, even for, and maybe especially for our wildlife counterparts. Grizzlies are slow to reproduce and raise young which makes them particularly vulnerable to losses like this and makes it even harder to stabilize their fragile population. It isn’t hard to imagine how devastating a loss like this must have been for 399. In the face of the things you can’t control, what do you do? What would your instinct be? It might have been to get revenge or to cry out in sorrow, but for an endangered species like 399, who had already suffered so much previous loss, perhaps all she can do is to move on. 399 will always be known as a mother, and losing her cub doesn’t make her any less so or any less respected. What these stories demonstrate is a deep instinct to love and protect. Granny’s leadership and steadfastness helped to keep her pod safe. F1226’s love for her new pups is palpable, as is the selflessness of AF923’s fostering. And imagining Grizzly 399’s sorrow and shock is enough to bring any mother to tears. The stories of these endangered species mothers are not only fascinating, but they give us a reason to pay attention and to care about what happens to them and their children. A world without mothers is a world where none of us make it. For who else would be there to nurture you, teach you, and love you? These are the stories we don’t often pay attention to because they don’t seem to matter. But they do. If they don’t matter to us, then maybe it’ll be the last stories we ever hear of them. To empathize with other species is a gift that humans have. Let’s use it well. It must be true that many of us learn empathy from our mothers, after all. Many of us learn true empathy, true love and sacrifice once we become mothers. And what love is deeper than that of a mother, no matter the species? All mothers are beautiful and are protectors of their babies be they human or animals. All mothers in the wild need protection.